We have knocked on thousands of doors, made as many calls, hosted dozens of house parties, participated in numerous candidates forums, and raised a good amount of funds. I want to thank everyone who gave so generously to us this year.color> Because of you, we are in a position to be able to communicate with thousands of voters to remind them to vote on Election Day. Now, it's crunch time! We are less than two weeks until the polls open, and we are now moving into the all-important Get-Out-The-Vote phase. This is when the rubber meets the road, and all of the hours that our volunteers invested in over the past few months will come to its fruition. I'm definitely ready, and I know you are ready to help us win! So, between now and Election Day, what can you do to help me? Firstcolor>, if you're in the Vienna area TONIGHT, please come and march with me in the annual Town of Vienna Halloween Paradecolor>! Beginning at 7 pm, the Keam Team will be celebrating the fall season in the heart of my House District by marching together in this huge community event. 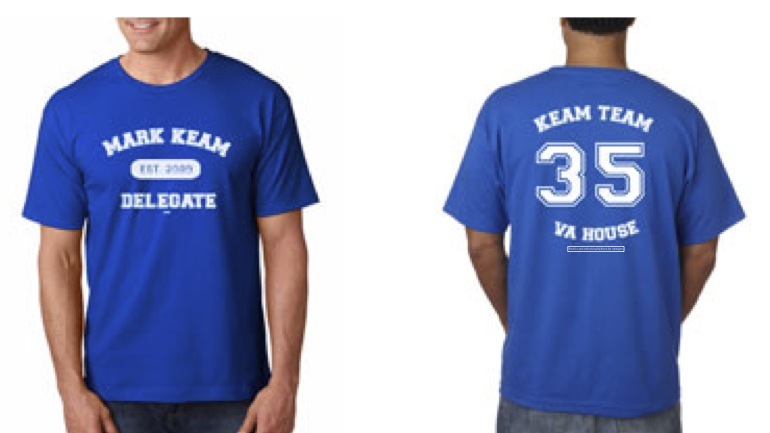 If you can march with us, you can have this hot-off-the-press Keam Team T-shirt! This one's sure to be a collector's item, so come and get yours today. Secondcolor>, if you can spare an evening or two over the next couple of weeks, please come to my office to make calls to our neighbors reminding them to votecolor>. Phone Banks in English and in other languages are being held every night, so please contact my campaign manager Julia@MarkKeam.com or call (703) 350-7377color> for more info. Thirdcolor>, we are still contacting voters in person by going door-to-doorcolor>. We could use your help for a canvass shift this weekend and next weekend as well. Please contact us if you have three hours to spare over either weekend. Julia@MarkKeam.com or (703) 350-7377color>. Forthcolor>, if you can volunteer on Election Day, we need folks to hand out sample ballotscolor>at each of the 19 precincts that make up the 35th House District. We need volunteers in manageable shifts from 6 am to 7 pm, so come and bring a friend. Again, contact us to volunteer. Julia@MarkKeam.com or (703) 350-7377color>. Finallycolor>, although we are close to reaching our fundraising goal for this election cycle, we still could use a few more bucks to ensure that we reach every single voter before November 5. Our mail program is very costly, so any amount you can spare would be greatly appreciated, even if it's just $3, $5, $10 or $25color>. Please go to my website to make an online contributioncolor>, or mail a check to Keam for Delegate, P.O. Box 1134, Vienna, VA 22183-1134. Thank you for your steadfast support and friendship. We will win on November 5 because of you! Paid for and authorized by Keam for Delegate.